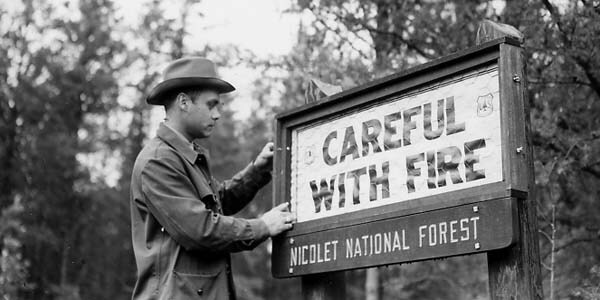 Fire warning sign being serviced by Ranger Crosby, 1959. Fire prevention and control efforts have been a part of the work of the Forest Service from the earliest days. In 1908, the Forest Fires Emergency Act authorized the Forest Service to spend whatever necessary to combat the increasing wildfires throughout the country. Fire prevention and control programs immediately began to grow from these funds. The Weeks Law of 1911 marked the beginning of federal-state cooperative fire control programs, and the Clarke-McNary Act of 1924 further increased the amount of federal funds available for fire control. In 1944, Congress tripled the fire prevention authorization under Clarke-McNary, and fire control efforts were again greatly expanded. The U.S. Forest Service Headquarters History Collection features numerous items documenting fire prevention and control efforts from throughout history. Cooperative Forest Fire Prevention (CFFP) program campaign materials: 1951, 1953, 1954, 1955, 1956, 1957, 1958. Smokey Bear Press Clippings: No. 2 (1953-1954), No. 5 (May 1955), No. 6 (September 1955), No. 7 (November 1955), No. 10 (June 1957), No. 14 (May 1959), No. 15 [a] (1959), No. 15 [b] (November 1959), No. 16 (February 1960), No. 17 (July 1960), No. 18 (September 1960), No. 19 (December 1960), No. 20 (March 1961), No. 21 (July 1961), No. 22 (October 1961), No. 23 (December 1961), No. 24 (February 1962), No. 26 (September 1962), No. 27 (October 1962), No. 28 (February 1963), No. 29 (April 1963), No. 30 (July 1963), No. 31 (August 1964), No. 32 (July 1965), No. 33 (January 1968), No. 34 (June 1968), No. 35 (November 1968), No. 36 (September 1969).